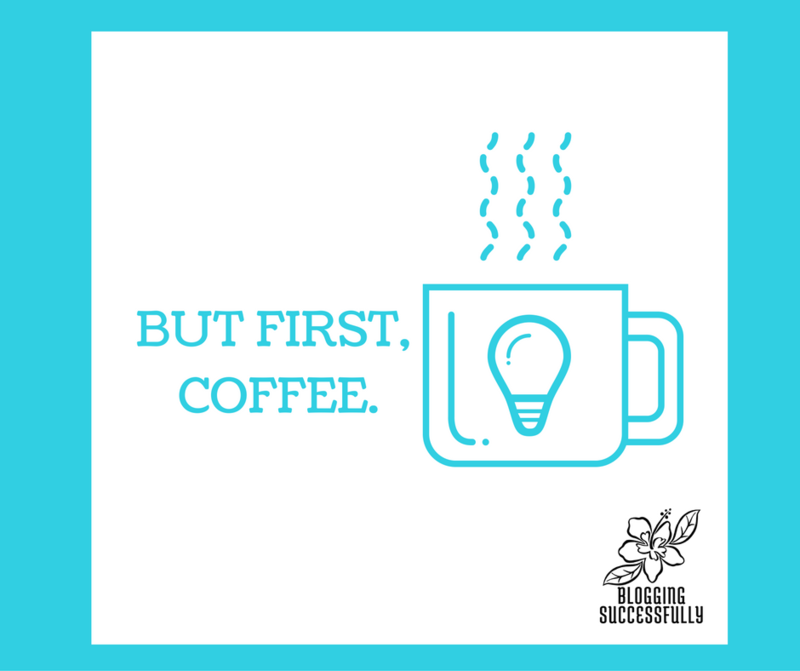 How do you ensure that you start your morning well? I've had a lot of mornings in my life (approximately 13,152 mornings), and I am just beginning to figure out the secret to a great start for my day. It's not rocket science, it may even be things your mom has told you for years, and you have overlooked. 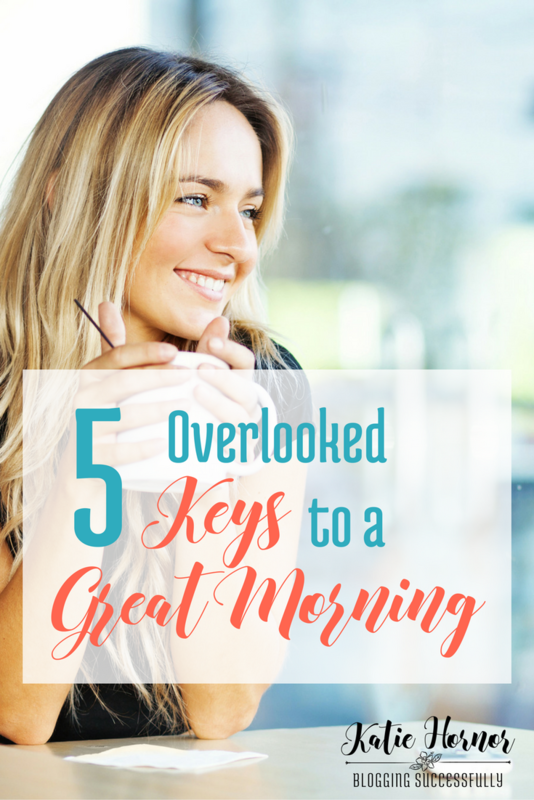 I believe that if you will be diligent to do these 5 things, they will ensure that you also start your morning well. Affiliate links are used in this post. To find out more or read our full disclosure, click here. This may seem unrelated, but if God owns your business, I believe he is just as interested in it's success as your are, and therefore you should talk to him about it daily, ask his direction and his blessing on the tasks at hand and the results he is leading you to pursue. It sounds cliche I know, but when you are fully dressed and make-up on, you feel so much more professional and capable, and it gives you a confidence to tackle work that you may not otherwise have. Not to mention that it is easier to record video or do a video coaching call when you know you look professional. Silly? I don't think so. I am sure you have your wake-up crutch too. Whether it is exercise, coffee, tea, or another form of caffeine, the day just seems to go much better when you are fully awake and alert and ready to work. I have a set of vitamins and essential oils that I use daily to keep me healthy. I am also drinking more water and no sodas. It is amazing how cutting out that much sugar has helped me be less irritable, which makes me feel better both physically and emotionally as I work through the things on my to-do list each day. For me, this is homeschool with the kiddos in the morning, and then the “big project” on my work to-do list for today. I organize my work by relegating certain tasks to certain days, so when it is time to work, I tackle the biggest task first to be sure it gets done. The Giveaway is Closed. Winner is Ann Odle! Want some practical help with setting up your day for success? 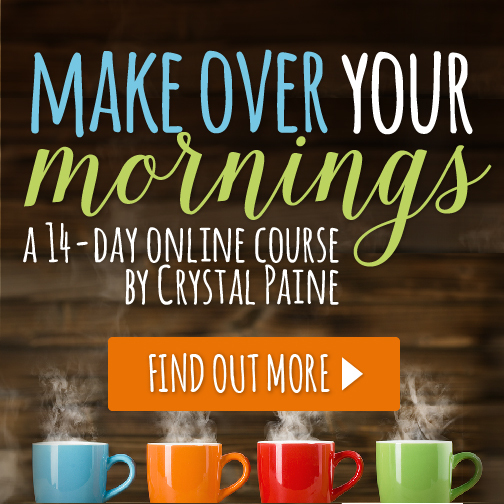 Be sure to grab a copy of Crystal Paine's online course, Make Over Your Mornings. Very affordable at just $17, Find out more about it or purchase here. Having control of my mornings is a must! I purposely schedule things to almost every morning on days I don’t work my ministry job. By doing this I am forced to get up and get ready for the day. Next is having the right setting to do your work. Pray, Pray, and pray some more! Thanks Susie. Routines are great aren’t they. While I feel my mornings are organized, I’m not too proud to know that there’s always room for improvement. More efficiency would help me work to meet deadlines and reach my goals during the time of day when I’m the most focused. So true, we all have room for improvement! Teresa, Thanks for stopping by. If I can help with anything blogging related, please let me know. I’d love to get up earlier but I need control of my evenings first. Hubby is a night owl so we are up much too late for me to get up early in the morning. Otherwise, I have a pretty good routine, it’s just later than most. Making over my mornings would be fabulous, especially since I’m not a morning person. I work with my clients I’m the late afternoons and evenings, so when I get home (often at 9pm), I’m zonked. I keep trying to figure out how to do this, but so far, no luck. Thanks for sharing this course! I’ll go check it out. As Danielle on here said, there is always room for improvement. I’d add that there is also always room for more, and fresh, motivation. Oh my mornings start soooo early; and it doesn’t help that I can’t seem to fall asleep at a decent hour. I’m not a mom–rather, my family consists of furry, irrational children who don’t pay attention to my lateness; so if I could find a way to make over my mornings, they would probably be as grateful and I would. Congratulations! You won! Expect an email soon with login details! I just signed up for the course! Who wants to join in with me? Mornings are totally not my “thing” but I’m learning that having a relaxed morning helps to make the rest of my day go more smoothly and be more productive. I’m working on a morning schedule/routine. Well, lets just say my days are a mess. I have no routine. I know some areas I need to improve in, I just don’t know how to do it. A better morning for us would mean a better day, better attitudes, and possible something getting accomplished!